As Plato would have said, wherever we look, all we can see are mental representations, latent or overt. If we take a step further and try to think about it, they develop into symbolic placeholders ready for what would come to our mind. What is represented, deeds or deer ? Yet, when confronted with the challenging complexity of our endeavors, we have to lump together the core symbolic representations of relevant aspects and drop whatever unduly catches our attention. That’s called modeling. As it happens, that is not the end of it and there is a specification tail to the descriptive head, sometimes even a continuum of models, from subjective representations bound by imagination, to engineering blue-prints, driven by technology. Along that line engineering models are clearly circumscribed, from requirements to system design, yet among them system modeling brings in specific challenges. ever, applied to those challenges which are usually dealt with at practical level. That runs counter to the more principled approaches used latter on the engineering process, for design or programming, and the objective is to bridge that gap with a modeling framework. Actual (natural phenomena) vs symbolic (models). Artifact (table or chair) vs natural (electrons and nuclei): the former are built (explicitly or not) from their symbolic representation, the latter (objects or phenomena) must be “discovered”. Live or inanimate: the former come as individuals, the latter (other than artifacts) have no identities of their own. It must be added that, as far as science is concerned, the perception of natural phenomena usually requires a symbolic apparatus. But engineering is not science and models are built with well defined purposes, namely to describe what is expected and prescribe how to achieve it. Systems combine software components with agents and devices. Models describe all systems components while programs can only deal with software ones. Models describe software components as well as agents and devices, programs can only describe software components. Given that models are abstractions, and abstractions are meaningless without context and purpose, it may help to distinguish between perspectives and abstraction levels. Assuming that the context is the enterprise and the purpose is information systems, there are three basic perspectives: business and enterprise, system functionalities, and platform technologies. Information systems are built to support business activities whatever they are, trading futures or controlling water canals. To be of any use systems must keep some record of their environment, and keep it separate, i.e as symbolic representations. The scope of required representations defines the footprint of applications; access and coupling constraints will define the functional architecture of the supporting system. There can be a significant margin between actual concerns and symbolic representations. Persistent representations record the state of business objects independently of activities. Transient representations record the state of objects while activities are performed. Persistent and transient representations do not necessarily coincide while processes are running, but they must be reconciled at completion. 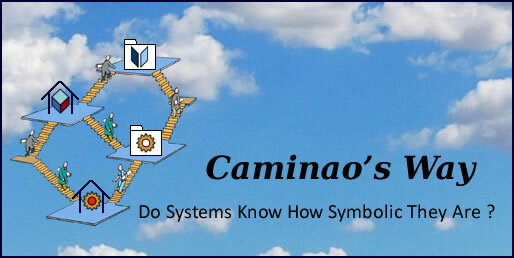 Systems are designed to process symbolic objects which may or may not represent something (object or activity) in their context. When they do represent something, symbolic representations may have to be kept in sync with their context counterpart. Depending on requirements and technical capabilities, synchronization may have to be supported instantly or some discrepancies are deemed to be accepted. Users are agents interacting with systems. They may appear in models as roles in activities (actor in UML parlance), actual persons in organizations, and entities in system records. If authorizations are to be managed independently those three artifacts must be modeled separately. Set on its own, accounting parties are often modeled as a generalization of Person and Organization. The unfortunate consequence is to merge “actual” entities with their accounting representation; in other words persons and organizations would not exist without being simultaneously a party, and that party would have to be uniquely defined by some specific system. That confusion between the representation of business and system objects goes a long way to explain misgivings between business and system analysts. – The connection between conflating user & party and the disconnect between business and system analysts needs some more explanation. to a lot of things written.